In this next part in our new series, Your Need to Know, Antonio Huneeus examines Project Blue Book. 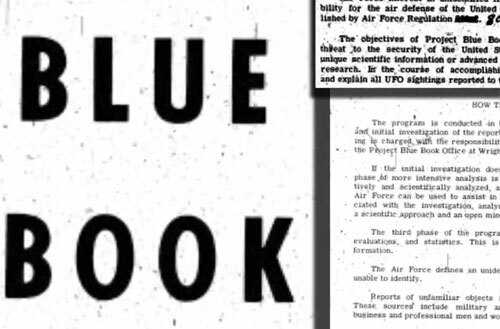 Blue Book was carried out over an eighteen-year period by the US Air Force, and was tasked with determining if UFOs were a threat to national security and to scientifically analyze UFO-related data. Each Air Force Base had an officer assigned to Blue Book who would collect UFO reports and forward them to Blue Book’s headquarters at Wright-Patterson Air Force Base. Each officer had authorization to interview all military personnel who witnessed UFOs and were not required to follow the traditional chain of command, underlining the seriousness of the project. In this piece, you can see a clip from an interview with Robert Friend, one of Project Blue Book’s directors. Blue Book saw many changes in leadership and staff through its eighteen-year existence. It also generated many contradictory conclusions, though there can be little doubt that it played a pivotal role in the official history of UFOs in the USA.